Mint Scented Rose Geranium is one of the best all around Scented Geraniums. The irregular variegation on the leaves brings highlights to a garden full of green. 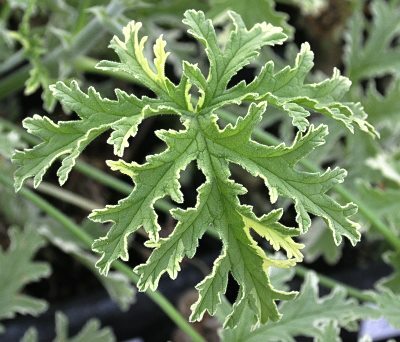 It is also nice because it doesn't get as large as some of the other scented geraniums which makes it a good size for smaller gardens and large containers. Add in occasional light pink flowers and a minty-rosy fragrance and you can see why this is one of our favorite scented geraniums. Mint Scented Rose Geranium has proven itself reliable here in zone 8. It also can take quite a bit of shade. Give it at least three hours of sun a day and it should be happy. Mint Scented Rose Geranium makes a great addition to our Zone-8-11 Fragrant Herb Garden Six Pack. Bet you can't plant just one!